I had to get my pants hemmed (required), so that was an extra errand I had to run. They were hemmed too short, however. For now, I’m getting into the routine, sort of. I had to leave at 7:30 AM today to get there in plenty of time. 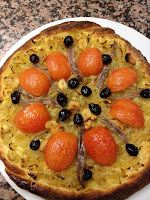 I made French pizza (onion tart with olives and anchovies), and it was quite delicious (if you like onions...and anchovies). The tie towel tucked in our apron is used to handle hot handles and surfaces, but is far too thin in comparison to the customary oven mitts. I felt like I was in a comedy scene, dancing around the oven, clumsy and trying to get this hot pan out of the oven. Still burned myself. 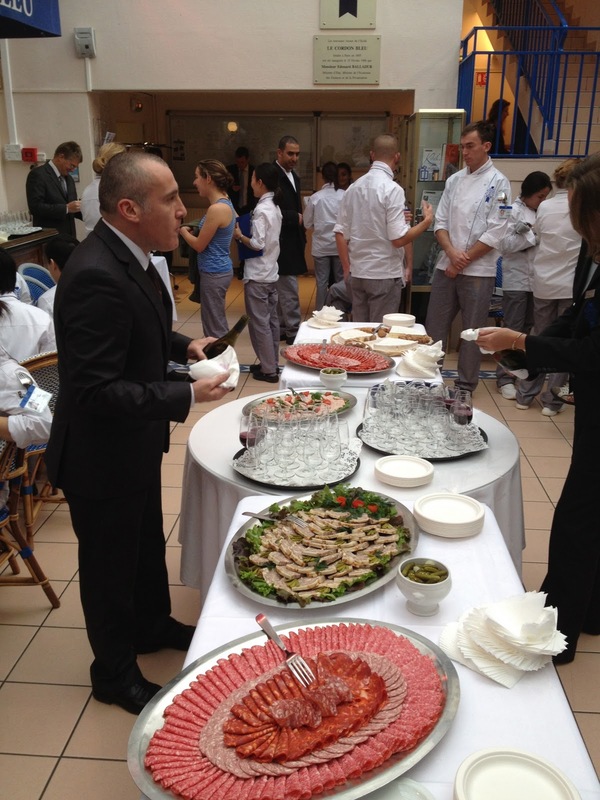 It was the first graded practical, with a Chef we have not worked with. He stood at the end of the granite counter watching. 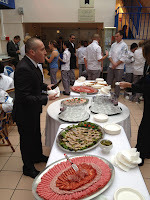 Unlike the first couple of days with Chefs assisting us. He tasted the crust=bon, tasted the tomato=bon, tasted the onions=bon travaillez (good work). When excusing ourselves from the practical, we need to ask the chef if we may leave. I go off to get some green nail polish to mark my knives. You would not believe how many students mistakenly take other students equipment. And our Wusthofs are valued at 900 euros. I’ve come to realize that the chinois, fine wired strainer, is my friend. Gets the clumps and the impurities out. There is no wifi at school, and as data dependent as I am, I’m getting used to it. The school gave the students a Wine and Cheese reception for Beaujolais Nouveau (it’s celebrated every third Thursday of November celebrating a new release of wine that is fermented only a few weeks before it’s release). Wine midday? At school? In the States it would be forbidden, but it’s because we drink too much. What a refreshing concept, to have wine midday without hassle. Fingers/hair/body/clothes smell like food. It’s in my skin now, not on it.